Sheep intestines, offal and Rick’s son, Jack, all made an appearance in last week’s episode of From Venice to Istanbul as they ventured through Albania. This week, Rick travels to Greece. The first people he meets on his journey are Virginia Papapostolou and her mother in Aspraggeli, Zagori. They show Rick a selection of recipes including hortopita or horta pie, made with filo pastry, feta cheese and wild greens, gigantes beans with spinach and chicken pie or kotopita -which Rick has gone on to name “the best chicken pie in Greece”. The pie is made from a whole poached chicken and onions – get Rick Stein’s chicken pie recipe here. Back in Rick’s kitchen in Symi, Greece, he cooks up souvlaki or kontosouvli, marinated in oregano and chilli. inspired by a recipe he sees in Ioannina in Epirus in Northern Greece. Further exploring Ioannina, Rick fishes on the Ioannina lake, meets sweet shop owners bursting with enthusiasm on Ioannina Island and visits Tonia Kortzi at the Pamvotis Restaurant. Tonia cooks crayfish and pasta, deep fried eels and carp, boiled crayfish and fried frog legs. Next, Rick meets Marina Siarava, a cookery student who had lost her job in the Greek economic climate and had to retrain. She cooks Rick a veal stifado with bulgur wheat salad, which Rick finds delicious. Back in his kitchen in Symi, Rick makes avgolemono sauce, made up of egg and lemon and used with the poaching liquor from celery and green vegetables, best enjoyed with fish. Moving on to Preveza, Rick tries his hand at early morning prawn fishing, before trying prawns in a sauce of tomato, basil and feta cheese, sometimes called prawn saganaki, which refers to the small skillet pan in which they are cooked. After a stroll along Preveza waterfont, Rick heads to En Plo Taverna and tries perfectly grilled fish, kefalos petayli, and Greek salad. Next is a visit to an ouzo shop, lined with barrels of ouzo which Rick gets very excited about, before travelling to Messolonghi for the next part of his journey. Rick tries another dish in his kitchen in Symi, stuffed peppers and tomatoes, a favourite of the film crew for lunch, discovered on the drive from Preveza to Messolonghi at the little fishing village of Astakos. After exploring the fish culture of Messolonghi, admiring the lagoons surrounding the town, perfect for trapping grey mullet for their roe, Rick goes on to try the last dishes of the episode with Petros Paragios: bottarga and clams in prawn stock with parsley, chilli and lemon juice. 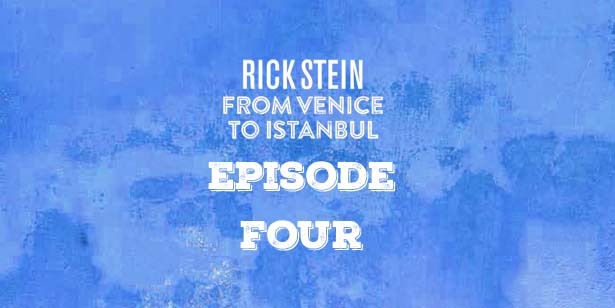 You can find all of the recipes from Rick Stein’s new TV series in his cookery book From Venice to Istanbul. Buy it online here. Book a table at one of our restaurants and try some of Rick’s new recipes From Venice to Istanbul. Discover how to cook Rick’s favourite new recipes on our one day ‘Mediterranean Street Food and Mezze‘ and two day ‘Cooking From Venice to Istanbul‘ cookery courses at Padstow Seafood School. The courses include dishes such as grilled mackerel stuffed with hot red pepper paste, parsley and garlic, stuffed duck and halloumi saganaki.